Decisions are only as good as the information behind them. Science is only as valuable as the level at which it’s comprehended. 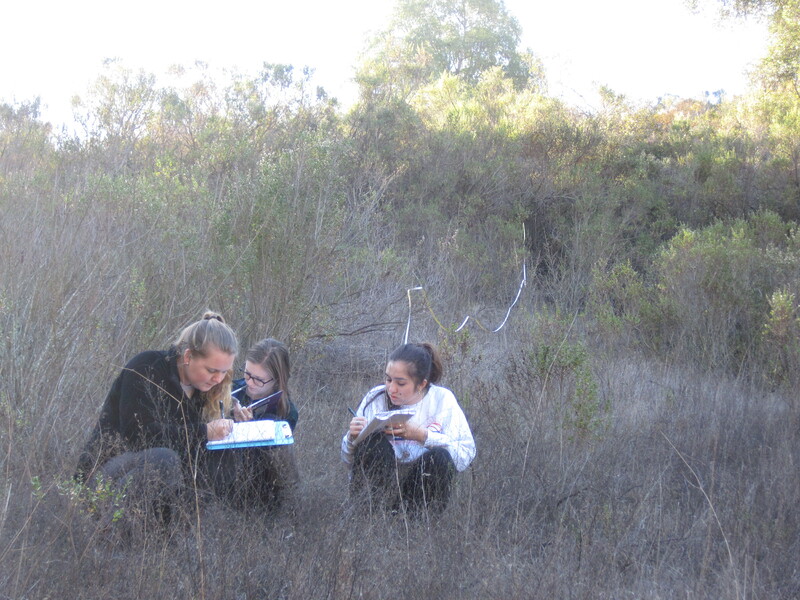 SCU Environmental Science students record species abundances along a transect as part of a field lab on biodiversity. As a scientist, I have a personal responsibility to make sure my work, and the work of others is readily accessible to all audiences. Part of that responsibility includes a commitment to teaching, especially at the undergraduate level where many young decision-makers will be exposed to the environmental sciences for the first and last time. As an instructor, I use a variety of student-centered learning approaches to cement core concepts in the classroom, and reinforce these concepts with inquiry-based laboratory and field activities. In lecture hall settings, I’ve found that small-group exercises, in which students debate and discuss topics their peers before regrouping as a large class to debrief, work especially well as a means of engaging every student and encouraging them to think about science in a nuanced way. Below, I’ve provided some examples of classroom exercises; contact me if you’d like another format or the “answer key”! Mystery species help students build a trait-based phylogeny. Teaching Assistant, Biology and Global Change, Stanford University, Winter 2011. Teaching Assistant, Core Ecology and Evolutionary Biology Lab, Stanford University, Spring 2011. Discussion Leader, Ethics in Ecology and Evolution, Stanford University, Fall 2011. Co-Instructor, Environmental Engineering: Sustainable Living and Engineering, MIT, Summer 2009.